The German Pinscher, a medium-sized breed that originated in Germany, is an elegant and energetic working dog with a noble appearance to match his strong personality. The breed may be rowdy and jumpy—puppy playfulness lasts well into adulthood—but with enough exercise, German Pinschers are fantastic companions. Training the strong-willed Pinscher isn't for the faint of heart. Without firm and consistent training, the German Pinscher is likely to assert dominance and attempt to manipulate his owner. Because of the breed's tendency towards mouthiness—pinscher comes from a word meaning 'nip,' as was his job as a ratter—the breed is best suited for homes without children or small pets. Owners who can provide a job for this energetic, alert, and eager breed will find an entertaining companion and steadfast protector in the German Pinscher. The German Pinscher is also known as the Deutscher Pinscher, or simply as Pinscher. Coat – The German Pinscher's short, sleek coat may be black and rust, red, fawn, or blue and tan. German Pinschers are an early European working breed, with drawings of dogs who resemble the type existing as early as 1780. The Pinscher's original purpose was working as a ratter who could rid farms and homes of vermin. The German Pinscher originated in Germany, and is one of the foundation breeds that contributed to the development of Doberman and Miniature Pinschers. The German Pinscher was originally called the Smooth-Haired Pinscher, but a wiry variety was often present in the litters of the breed. Eventually, the types were bred and registered separately—the wiry-coated dog became the Schnauzer, and the Smooth-Haired Pinscher became the German Pinscher. When World War II left the breed nearly extinct, Werner Jung scoured the German countryside in search of pinscher-type dogs to revive the breed. He bred large examples of other pinscher-types with his female German Pinscher and was able to save the breed from extinction. The first German Pinschers came from Europe to the United States in the 1970s, and the American Kennel Club recognized the breed in 2003. German Pinschers are always alert, watchful, and ready to work. Their high energy and playfulness can make them a handful, but with enough exercise they're good-natured companions. Without regular training from a consistent owner, the breed's high prey drive and dominant personality can lead to trouble. German Pinschers provided with a job are happier and better behaved than their idle counterparts. Are German Pinschers Good with Kids? Though German Pinschers may do well with older kids, they're not an ideal match for young children, toddlers, or babies. They don't tolerate prodding and tail-pulling, nor do they like sharing their toys and food. If raised with children from puppyhood, they may learn to coexist. They're often bouncy and may knock over small children. Polite greetings should be enforced. Are German Pinschers Good with Other Pets? If raised with them, German Pinschers may be able to live with other dogs—but an only-dog home is often best. Due to the German Pinscher's high prey drive and dominant nature, the breed isn't well suited to homes with other pets. Protecting his property is in the German Pinscher's nature. He will bark to alert you of strangers and may attempt to protect his family and home from intruders. Socialization is important to properly direct the breed's instinct to guard. The Pinscher is not a nuisance barker—if he barks, he's alerting you to trouble and you should go investigate. Energy is not a quality the hardworking German Pinscher lacks. He needs plenty of physical and mental stimulation to prevent his high energy from causing behavioral problems. Stubborn, manipulative behaviors are common in the German Pinscher. Due to his high prey drive, the German Pinscher is often best as an only pet. While affectionate with family, the German Pinscher may be suspicious of strangers. Early socialization is imperative to prevent suspicious behaviors from getting out of hand. A job is the best way to keep him from developing destructive or undesirable behaviors. Few litters are born each year—the breed may be difficult to find, and the small gene pool may contribute to health concerns. This breed tends to jump up and offer exuberant greetings. Indoor German Pinschers need plenty of opportunity to stretch their legs—this includes playtime inside and time to run outside. They're not ideal apartment companions due to their exercise needs, but they may be able to adjust if there is easy access to a fenced outdoor area. They're often playful, bordering on rambunctious, and are not happy cooped up indoors all day. They desire time and attention with their family. Outdoor While German Pinschers enjoy time spent outdoors, they should be supervised and kept leashed or allowed to run in a fenced area. This escape artist has a high prey drive and a mind of his own, and once loose may prove difficult to catch. The breed isn't meant to live outdoors full-time, and should not be chained outside, as this may open the door to aggressive behaviors. His attachment to family means he is not likely to adjust to a kennel situation. Exercise At least an hour of high-impact exercise is necessary for a well-behaved German Pinscher—more is better. 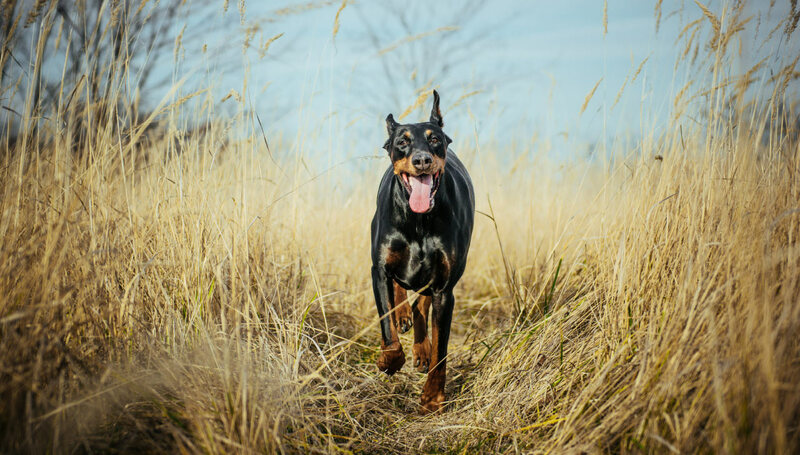 Physical and mental exercise are top priorities for this energetic working breed, and without enough exercise the German Pinscher may become destructive or difficult to manage. Endurance German Pinschers lack nothing when it comes to endurance—the breed was developed with working dog stamina and a desire to succeed. Running Miles: Long runs are among the German Pinscher's favorite activities. Allow him to run alongside your bike for a high-impact workout. Hiking Miles: A day on the trail is a wonderful form of exercise for the German Pinscher—but keep his prey drive in mind. Off-leash, an animal or a scent may be far more interesting than your recall. Food The general recommendation for how much high-quality dry dog food to feed a German Pinscher is one to two cups per day, split between two or three meals. This amount is based on average weight and activity level. German Pinschers may be territorial when it comes to food and they may present some food and resource guarding behaviors. If your German Pinscher displays any resource guarding, consult with a behaviorist to determine the best way to manage the behavior. Children should never be allowed to touch or remove food from any dog while it is eating. Alone Time German Pinschers may be able to stay home alone for a few hours each day, but they prefer to spend time with their people. If they cannot join you on your outing, they should be left in a dog-proofed area or a crate. Plenty of exercise should be provided before you leave and directly after you return to prevent negative behaviors. Minimal grooming is necessary to keep the German Pinscher's coat in good condition—care includes weekly brushing and baths as needed. Trimming nails regularly will help prevent painful splitting, cracking, or breaking a nail. You can minimize serious health concerns in the German Pinscher by purchasing him from a reputable breeder who engages in responsible breeding practices, and through screening for common diseases and conditions. The assertive German Pinscher needs a consistent owner who will dedicate time to his training. This intelligent breed tends to pick up on basic obedience quickly when positive reinforcement methods are used. Set—and enforce—boundaries from puppyhood to prevent the manipulative Pinscher from walking all over you. Basic obedience and socialization should be priorities for training this strong-willed breed. The more energy a German Pinscher can burn, the better. Activities that put the breed's athleticism to the test are a good match. Agility, advanced tricks, rally obedience, and other canine sports are fantastic ways to help the German Pinscher get the exercise he needs. The German Pinscher is not a common choice as a modern hunting dog, but may do well in barn hunt or tracking exercises and is likely to rid your home and yard of rodents. The name 'Pinscher' may refer to a number of traits, and the origin of the name is debated. Some claim it refers to the breed's hunting style—the name may be derived from the word pincher, meaning a thing that pinches, bites, or nips. Others insist the word pinscher is German for 'terrier,' while still others claim it comes from the word pinsch, meaning 'clipped,' in reference to the cropped ears. German Pinschers are not considered a hypoallergenic breed.